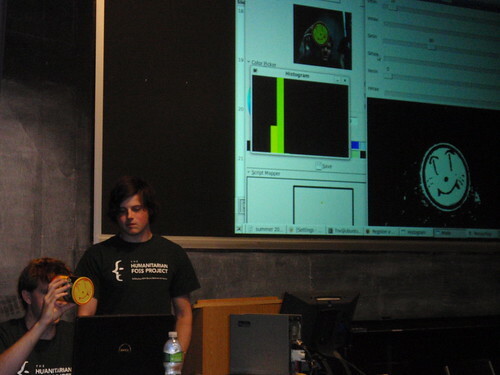 Ted Nichols (Wesleyan ‘10) and Antonio Alcorn (UConn, ‘10) gave presentations on behalf of the HFOSS summer students at the final weekly session of the 2009 Trinity Summer Science Program. Ted is shown here demonstrating the MouseTrap project. Katrin Verclas addresses HFOSS summer students. Katrin Verclas, co-founder and main editor of mobileactive.org gave a talk at Trinity on using mobile technology for social activism. Katrin was one of the keynote speakers at this year’s ISCRAM conference, held in Gothenburg, Sweden in May. 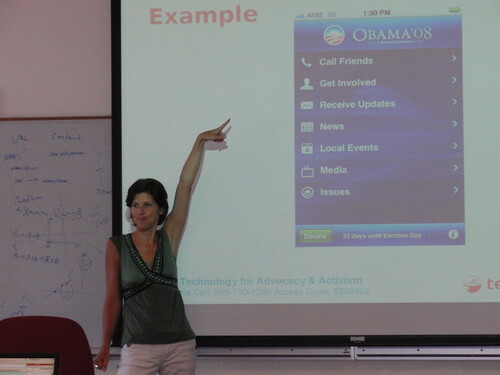 Her talk at Trinity focused on the uses of mobile technologies to effect social change. MobileActive.org is a global network of people using mobile technology for social impact. Their web site hosts an incredible collection of resources about mobile technology, including how-tos, research reports, news items, and much more. At lunch with some of the POSIT team after the talk Katrin proposed that we hold a BarCamp in NYC at the UNICEF headquarters as a way to bring together groups building humanitarian applications on mobile phones. We agreed to co-sponsor the event, which is going to be held on October 24th.